In this month's RE:INVENTION Report, we're giving 'thanks' for the business tools that help modern companies invent new products and services and reinvent lackluster brands and business operations. In the U.S., the Thanksgiving holiday is the ultimate invitation to innovate. Enjoy our cornucopia of tasty treats. 1. While the Thanksgiving holiday is riddled with myths - a fairytale of friendly pilgrims dining with Indians - it's a perfect time to reflect on diversity. After all, diversity and dissent light a fire to innovation. 2. Turkeys aren't the only birds around this holiday: here's What Twitter Can Teach Us About Product Development. 3. This Month's Inspirational Innovator: Chicago may be the Protein Bar's "Plymouth Rock" but it's in great shape to pioneer its voyage across the United States. • Native Americans taught the Pilgrims a lot about the New World. Human progress relies on adaptation and the advancement of good ideas. Here's how social intelligence can do that on a massive scale today. • What have these Parking Pilgrims been up to? Check out our Expert Series featuring parking garage reservation startup Spothero. • Collaboration allows us to preserve our histories, share and learn from each other. We've come a long way since that first Turkey Day. This month, RE:INVENTION hosted our "Driving Successful New Product/Services Launches in the Financial Services Industry" Webinar with KCD PR. We're thankful to all attendees. View the presentation. Join RE:INVENTION for our next webinar, "The 12 C's of Commercialization" at 10 AM Pacific time on December 11. The 12 C's of Commercialization help companies overcome the challenges of commercializing new products and services -- concept testing through community building. During this 1 hour interactive webinar, we'll introduce each of the 12 C's and share tactics for applying the C's to dramatically boost your company's new product/service success rates. • Every President since Harry Truman has pardoned a turkey for Thanksgiving. • Want to know if a cranberry is ripe? Throw it at the ground and see how high it bounces. • Thanksgiving falls during Hanukkah this year. It will be 79,043 years until Thanksgiving and Hanukkah converge again. • With Thanksgiving at hand, it's time to consider the progress you've made this year. Take our free assessment test. We'll evaluate your company's innovation capabilities and share how you score versus like-companies in your industry. • Ready for 2014? Hire one of RE:INVENTION's C-level executive pros part-time to guide your New Year fresh start. Learn more about our CxO for Hire service package. So, what's the answer to our headline? 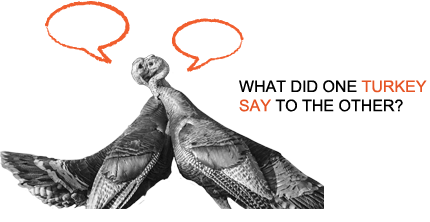 What did one turkey say to the other? Nothing. Because Turkeys can't talk. From our team to yours. Happy Thanksgiving! For over a decade, RE:INVENTION, an innovation consulting firm, has jump-started growth and created a culture of transformation for 60+ clients, from Fortune 500 leaders to Inc. 5000 startups. We're change agents who have helped companies invent over 40 new products and ventures and reinvent lackluster brands and business operations.